Aboriginal student Ann Windels chats with international student Gustavo Aguilar prior to hitting the slopes on their first-ever day of skiing during the Escape to Silver Star Mountain Resort tour. The North Okanagan was showcased for more than 40 UBC Okanagan international and Aboriginal students during an Escape to Silver Star Mountain Resort tour last weekend. "It was a great opportunity to meet other people and to socialize," said Gustavo Aguilar from Costa Rica. "I come from a tropical country and I ended up doing something I never thought I would do. I went skiing." The off-campus winter excursion was the second of the school year -- last September more than 30 students toured the NK'Mip Desert Cultural Centre near Osoysoos and took part in the Okanagan Nation Alliance's annual Salmon Feast celebration. "Many students new to the area are tied to the transit schedule and don't get to see how diverse the Okanagan is," said Adrienne Vedan with Aboriginal Programs & Services. 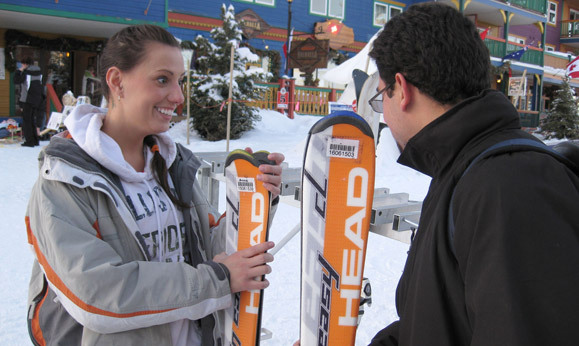 "The tour down south visited Canada's only desert while Silver Star's family atmosphere was perfect for entry-level skiing, boarding, tubing and skating." Students expressed interest in having more off-campus events. "The whole experience was amazing. I tried skiing for the first time," said Apara Ranjan from India. Silver Star Mountain donated many door prizes. 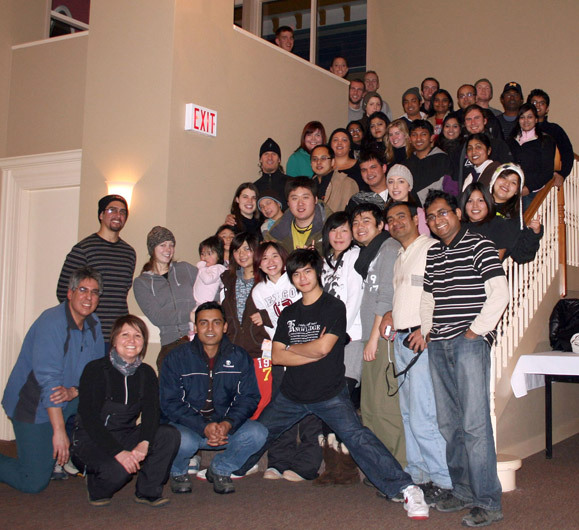 The winter escape included bus transportation from UBC Okanagan and chilli dinner. Nick Therrien, a work study student with the Peer Support Network (PSN), coordinated students on the bus and then donned his ski instructor hat once out on the slopes. "It was a great opportunity for some aboriginal and international students who typically don't get to participate in winter sports," said Therrien, who also serves as president of the Varsity Outdoor Club. "It can be tough for anybody on their first day of skiing, but it was great to see students from all over not afraid to try something new." Aboriginal student Nicole Nordquist says she thoroughly enjoyed the experience, though it took her outside her comfort zone. "I've had a fear of snow sports since I was a little girl. But after getting up there with a bunch of other students who were new to mountains in the winter as well, I had the time of my life," said the PSN worker. " I'm really glad I went and plan on going back." Students were all smiles during the group photo in the Chilcoot Inn.